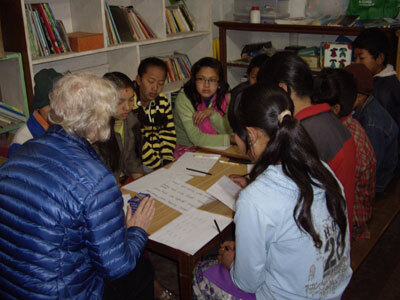 Good Works - Trekking in Nepal with Teresa, Slow Trekking for peoples of all ages. 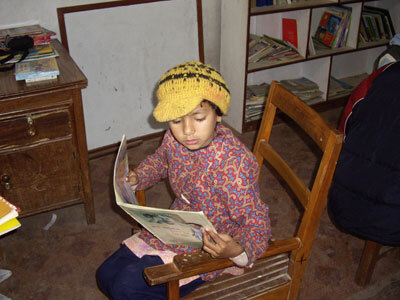 Lots of great work is being done in Nepal to help developing communities everywhere. I am lucky enough to be involved with the work of Isabel Armer and Netra Basnet at Faika, near Kopan in Kathmandu. About 7 or 8 years ago Isabel Armer contacted me through a member of my dancing class at the Victorian College of the Arts. My tap-dancing mate had a son in Isabel's geography class at Trinity Grammar School. Isabel asked me to take some books in my luggage and the friendship and co-operation grew from there. I started to ask my trekking customers if they could fit in any second-hand clothing, books, toys, etc. We gave some to our porters kids, some to kids along the way on trek; some special items go to the Bright Future Community Centre. The BFCC helps about 80 kids and their families. We pay the kids school fees, help them with clothes and books they might need and sometimes, in a tight spot, we help their parents where we can. This help could range from a few blankets or a bit of lino (thanks Liz); a medical bill or even a few months rent paid while the family gets back on its feet after a setback such as a death of the breadwinner. The main work of the BFCC is to keep kids in school. Local schools, some government some private, though very basic. We have classes before school which are very well attended. The kids get extra English lessons, especially when there is a volunteer on board (thanks Liz/Elizabeth/Robina). It is very rewarding work. The kids just lap it up. They come at 7 am before school and the programme is well-attended. On Saturdays we break out toys and sports equipment. There are traditional dancing classes for boys and girls and we hope to get a bit more going in the musical education area. The kids do artwork and have their own card-making business. I was amazed to learn that the kids gave at least half of what they made with the card-making to charity - disabled kids. Can you credit that? Isabel Armer works tirelessly at home, in Richmond, Melbourne and up in Kathmandu for 3 - 5 months of the year. Luckily for us, she has retired from full-time teaching. She talks to Netra Basnet, our manager, almost every day. Netra does a sterling job. Anyone who has met him when we've visited as part of a trekking holiday, will know that he is a gentle and capable man. At 28 he is seriously considering marriage. I think he is going to make someone a lovely husband. Good looking too! Isabel has worked to arrange a three-roomed clinic in conjunction with the Red Cross. Netra also runs the Dreamland Computer School. This started life as a Rotary project and now has almost enough paying customers to be self-supporting (almost). Our newest venture is the Ketiko Sewing Company. The girls are just learning basic skills right now but it is my hope that they could produce export-quality clothing to my own designs in the future, earning a good cash income and giving them a sense of pride as well as some financial independence. Still, this is a little way off yet. I am attaching the most recent Newsletters from the projects. Hope you enjoy reading about the kids. You might be inspired to work with us for a while when you next visit Nepal, to trek with me, to trek independently, or just come up for the spell of volunteering. Kopan is right out on the Northeastern edge of the Kathmandu city so its not as crowded as the downtown areas. Still a few green fields around the place and the beautiful Kopan Gompa is just twenty minutes walk away. Its also just half an hour's walk from Bouda with its amazing stupa and huge Tibetan community. We often walk over there for dinner. Lodgings at the Shambala or, my preferred choice, Muna Cottage is very reasonable - around $10 a night - with clean bathrooms (mostly attached) and really nice food (especially at Muna's). Whether you trek with me or not, do consider coming over to see our projects - the kids love visitors. Please click here to visit our good work newsletter page.